Take a stroll down any of the world’s most fashionable streets, and what will you notice? From 5th Avenue to Rodeo Drive, Avenue des Champs Elysées to Via Montenapoleone, there always remains one common denominator. Sure, there are times and places for color—lots of color—but black will always be tasteful and timeless. Every season, some lucky hue is crowned the new black, only to be surpassed by whatever the next big trend is. But through that competition of the colors, all the while, black never goes out of style. A black ensemble is brilliant because it acts as the perfect canvas allowing the subtleties of your accessories to shine through, but not overwhelm. And if there’s one brand that understands the value of minimalism and subtlety, it’s the watch designer Daniel Wellington. 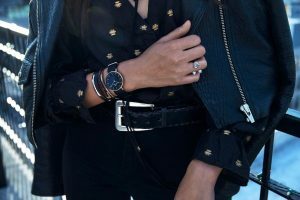 The rollout of Daniel Wellington’s latest collection proves their acute understanding of black’s simple beauty. The fresh lineup is called Classic Black, and it’s available here at URBANfusion Skippack at unbeatable prices. 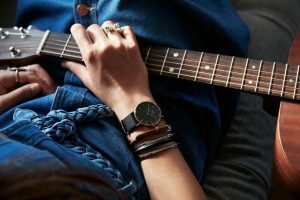 Daniel Wellington’s flagship line, the Classic Collection, was introduced in 2011 to the celebration of watch enthusiasts and fashion connoisseurs alike. Its simple and stunning design, along with interchangeable straps, allows for unequaled versatility while accomplishing an impeccable balance of form and function. Not to mention, the Classic Collection offers wearers a luxury quality product at prices far beneath those of its extravagant competitors. Now, Daniel Wellington has taken its most popular collection and made it a few shades darker. Classic Black offers all of the advantages of its sibling line, while displaying its understanding that black is just…better. Classic Black starts at $175 in our Skippack URBANfusion store. There’s no denying that fashion is a tough market to enter, with age old establishment brands maintaining their godlike statuses from on high. Good luck to all ye who attempt joining the club. In 2011, Daniel Wellington did just that, and shook up the fashion world like no other. How did they accomplish such a feat? The 31-year-old sole owner and founder of the Daniel Wellington brand, Sweden native Filip Tysander, doesn’t consider himself some kind of millennial entrepreneurial genius. He simply had a vision, saw two holes in the watch market, and figured out how to fill them in a very profitable way—a way in which he wouldn’t have dreamed just five years ago. What were the holes? For one, he saw that the watch market had ample room for a brand with luxury looks at truly affordable prices. Secondly, he saw that the establishment watchmakers weren’t utilizing social media to their fullest potential. So he filled the voids, and is now running a $170 million business, followed by an ever-growing online fan base. Speaking of social media, be sure to follow ours here for the latest from Daniel Wellington, PANDORA and much more. And stop by URBANfusion Skippack today to see for yourself just how stunning (and affordable) black can be.